Nylon parts like these, denied of moisture, can become brittle. Read on for the cure. Nylon cable ties and parts can become brittle and snap during installation, especially in the winter when it’s cold and dry. But, rarely is defective material the cause. Instead, it’s typically lack of moisture. Place the brittle parts into a Ziploc® or other airtight, plastic bag and sprinkle them with water. Let them sit for as little as 12 hours and you’ll be surprised at how flexible and strong they become. 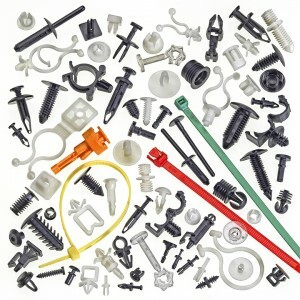 Most nylon ties and parts you buy from us are made from type 6/6 Nylon. Manufacturers ship the parts in heavy-wall, heat-sealed, polyethylene bags. Before the bags are sealed, they add moisture at the rate of .025 times the weight of the parts. Then, they recommend you store the bags at 73°F (± 15°F) at 50% relative humidity. If your warehouse, factory floor, or assembly area is not kept at that temperature range or relative humidity, or if you open a bag of nylon parts and don’t reseal it airtight, brittleness and snapping may result.